Originally formed in Berlin in late 1998, the project was put in hiatus after first initial test recordings until early 2008 when Nikolai Arnold and – later - Johanna Blackstone joined KaS (Art as Punish-ment). Drawing inspiration from Lustmord, Neurosis, Throbbing Gristle, Coil or Brian Eno, KaS is a continuous movement in which they inspire, deconstruct, invent, and flow with their surroundings. Every sound influences the next. There is no beginning and there is no end. The project is an open door for people to come together and experience noise as it comes naturally from the universe, through them and to them. KaS is an ever changing array of people. KaS is not a band but rather an ongoing exploration with many contributing to a creative process of quasi-subconscious output. 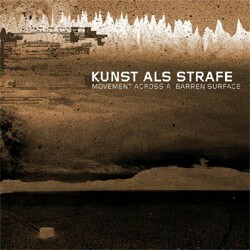 KaS are pleased to have had Steven Stapleton (NURSE WITH WOUND) contribute to a few tracks on this album. 9. In The Void The Stones Are Drifting .